You can get Corning InfiniCor multimode fibers from Fiber Optics For Sale Co. by clicking on the following picture. Corning studied various techniques for optical fiber manufacturing, including outside vapor deposition (OVD) and inside vapor deposition (IVD), they finally chose OVD process. This is based on OVD process’s consistence, higher quality, and the ability to scale for large volume production. One of the most important advantages of the OVD process versus IVD surrounds bandwidth uniformity. Variability in the fiber manufacturing process, specifically in forming the core region can lead to bandwidth variability in the full length of the fiber. This is a problem since most manufacturing measurements, such as those made during the Modified Chemical Vapor Deposition (MCVD) process, are made on the full fiber lengths (up to 17.6km), while the application of the fiber in network links is usually less than 2km. 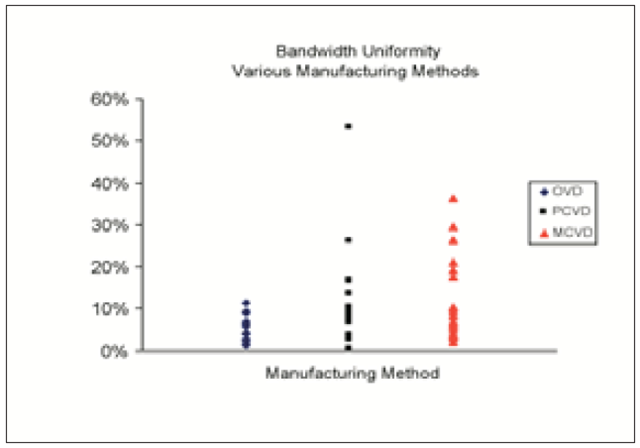 Given the difference between the measured fiber length and application fiber length, it is very important to understand how the bandwidth measured during manufacture relates to the bandwidth of the fiber length that is deployed. This is of particular concern in the MCVD method since there are process conditions such as higher thermal conductivity oft he glass than the deposited chemicals and geometry variations in supplied third-party tubes that make it prone to axial bandwidth non-uniformities. In a recent study at Corning’s Center for Fiber-Optic Testing (CFT), Corning measured a number of high-bandwidth 50/125um fibers, all with Effective Modal Bandwidth (EMB) between 950 and 4000 MHz*km, made from both the IVD and OVD manufacturing processes. The study involved measuring both the full 8.2km length (as manufactured) and 4.1km halves of the original fibers in order to gather a very accurate measurement of the consistency of the EMB value along the entire fiber length. These measurements revealed an average of 13% difference in EMB value between the 4.1km halves for MCVD produced fibers compared to a 3% average difference for Corning’s OVD produced fibers (see above figure). Typical application lengths for multimode network systems can vary from 100m to 550m. Therefore, a wide variance in the actual EMB value of the fiber compared to what might be specified for an IVD manufactured fiber poses significant system risk in high-performance multimode fiber applications. Despite significant data to the contrary, IVD fiber manufacturers have often claimed that their manufacturing processes are superior to those of Corning’s chosen OVD process for producing multimode fibers. One typical argument focuses on perceived “centerline dips” in the refractive index profile (RIP) of multimode fibers. IVD fiber manufacturers’ claim is that these profile errors can impact the bandwidth, or transmission capability of the fiber. Corning’s laser-optimized fibers use a centerline etching process which is very effective in achieving centerline profile control. 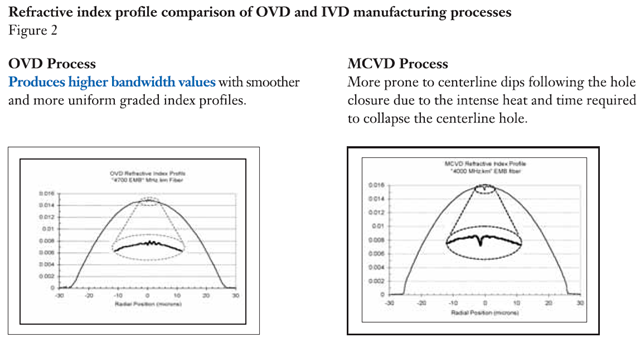 A recent review of Corning produced and competitor’s IVD produced multimode fibers shows that Corning’s OVD process produces outstanding centerline profile control which is proven to be superior to the IVD process. See the figure below. Recent claims from some cablers have focuses on testing performed in 2004. This testing compared Corning’s fiber with an IVD manufactured multimode fiber. The experiment concluded that the IVD process produced a higher quality 10 Gb/s, 50um multimode optical fiber (i.e. OM3 fiber). Corning argues that this conclusion is not accurate because the experiment compared a 550m, 10 Gb/s product from a prominent IVD manufacturer with Corning’s InifiCor SX+ fiber, a product designed and specified for 10 Gb/s performance over 300 meters, using one transmitter/receiver combination. 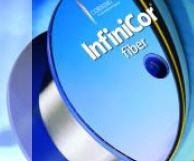 Corning argues that a comparison of similar products over a broad range of transmitters and receivers would produce at least similar, if not superior results for Corning’s InfiniCor fiber products. Corning’s CPC coating enables a fiber with resilience to environmental conditions such as temperature cycling, often experienced in campus networks and unregulated duct environments. Corning performed a competitive study of ribbon cable design containing new microbend performance coatings from 2 other major multimode fiber manufacturers. The result is shown below. It shows that the cumulative positive impact of the CPC coating is dramatic. Multimode fiber is the most complex fiber type to characterize for system performance. Corning measures every single meter of their InfiniCor multimode fiber products in house. They don’t do sampling or outsourcing. The following figure shows Corning’s DMD and minEMBc measurement methods. Recent CFT system testing performed on Corning’s InfiniCor SX+ and eSX+ fibers and another leading fiber manufacturer’s equivalently branded products demonstrated that not all fibers are equivalent. As shown in the figure below, all of the InfiniCor fibers met and often exceeded the minimum link length against which the fibers were sold for 10 Gb/s system performance.